Asus Transformer Book Trio: it's a bird! It's a plane! It's a BBQ! You've got to admire Asus. Where other manufacturers churn out barely differentiated me-too devices, Asus loads up on energy drinks and comes up with some truly odd ideas. 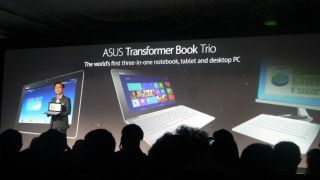 The latest: the Transformer Book Trio, a device that magically changes from an Android tablet to a Windows 8 PC. It's essentially two devices glued together, with twin processors - one for Android and one for Windows - and a hard disk that lives in the tablet's dock. With Android running native rather than in emulation there shouldn't be a performance penalty, and Asus promises effortless synchronisation between Windows and Android modes. It's an interesting idea, but that doesn't mean it's a good one - or a new one. Lenovo had the same idea back in 2010, and it suffered from the same problem as the Trio. When it comes to mobile computing, two heads aren't better than one. We're in the middle of a shift from software to services, and increasingly our devices simply connect to the cloud: Facebook, Twitter, Google Docs, Spotify, SoundCloud, SkyDrive, DropBox, Flickr... you get the idea. Those services are available for, and adapt to, whatever we happen to be using - so there are smartphone versions for when you're on the bus, tablet versions for the sofa and desktop versions for when you're supposed to be working. That's good, because we value different things according to where we are. Out and about? Portability, battery life and fast mobile internet. At home? Wi-Fi and a screen that's big enough to tweet or shop but not so big it pins you to the sofa. At a desk? Big screen, nice keyboard, full-fat apps and a broadband pipe fat enough for 4K footage. I don't think you can make a single piece of hardware that meets those criteria. The Trio's 11.6-inch screen is too small to be much fun for prolonged desktop use, but it's too big for comfortable commuting (or even sofa surfing: most tablet activity happens in people's homes, not out and about). It's clearly going to cost much more than a decent Windows laptop and a decent Android tablet combined, and of course it's going to be heavy too. And having two different OSes in the same device isn't exactly elegant, no matter how quick the hotkey switching. I'm all for hybrids - I quite fancy Dell's XPS 18 - but there's a difference between a dockable tablet and two completely different devices glued together. The Trio looks awfully like the latter.